Christmas. Sigh, it is almost Christmas again here in The Present but allow me to do a brief time slip to last year's Yuletide for another installment of "Catching up" (I am determined to reach this year by...this year!) 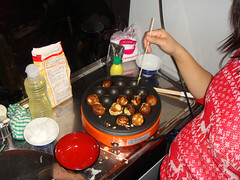 Actually I don't think a lot of horribly exciting things happened during that time but rummaging through my badly organized picture folders, I did find a couple of snaps documenting a semi-successful attempt at creating that old classic of Danish Christmas desserts: Æbleskiver. 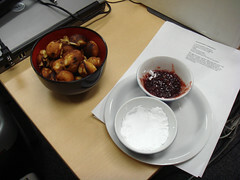 ...The making of which took the most of a day (at work, erm...) and resulted in a pile of tiny æbleskiver (of questionable taste, but jam is your friend) made on a pan that is usually reserved for frying octopi into takoyaki.